Rattly the Rattlesnake is a large, green, red-ringed rattlesnake and an Animal Friend of the Donkey Kong franchise. His first appearance was in Donkey Kong Country 2: Diddy's Kong Quest. Rattly is an inhabitant of Crocodile Isle but is described as a rebel against the Kremling Krew. Rattly's body is coiled up like a spring, which he bounces on to move around. His main attribute is the ability to bounce high. 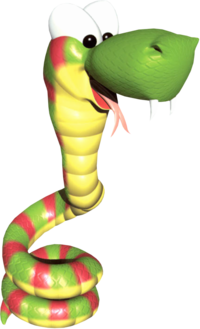 In this regard, Rattly is considered a successor to Winky the Frog from Donkey Kong Country. Rattly is an infrequent Animal Friend in both Donkey Kong Country 2 and Donkey Kong Land 2, where he only appears in a few levels. 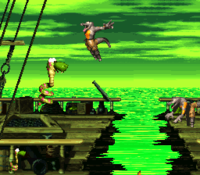 In both games, he can Superjump to perform an even higher jump (which can be performed by holding down [or in the SNES version] and releasing it in Donkey Kong Country 2 or in Donkey Kong Land 2). This allows for him to reach normally inaccessible locations (that are usually unreachable by the Kongs, even with their Team-up ability), sometimes to find a level collectible or Bonus Barrel. He is also able to jump in midair, but only while hopping (his walking/running animation) or falling from a platform. Rattly is able to bounce off Zingers harmlessly. Aside from Zingers, Kaboings are another common foe of Rattly's. In his first level appearance, Topsail Trouble, Diddy and Dixie start the stage in front of a Rattly Crate (or Rattly Barrel in Donkey Kong Land 2). They can optionally use Rattly's assistance to climb the ship mast, up until the No Animal Sign next to the Star Barrel. Rattly in Toxic Tower of Donkey Kong Land 2. Rattly is the main feature of his second level appearance, in Rattle Battle. Unlike Topsail Trouble, the Kongs are required to transform into Rattly, via a Rattly Barrel in a small room at the start. Rattly's special abilities are evident in the stage, because he must cross wide gaps, typically by bouncing from a few Zingers. Rattly even bounces off some Barrels fired by Kannons near the end of the level. The Kongs can optionally ride Rattly in the Gloomy Gulch level Gusty Glade in Donkey Kong Country 2 (but not in its Donkey Kong Land 2 counterpart). This does not ease the challenge of withstanding the strong wind gusts. In Toxic Tower, the Kongs are required to transform into Rattly to perform high jumps to escape from the rising poisonous slime, up until the Star Barrel, where Squawks takes over for most of the second half. Rattly is used for the final segment in Animal Antics, in which his segment takes place in a jungle (just like Rambi and Squitter's parts at the start and middle, respectively). Two Rattlys on the bridge of Port City. Rattly makes a cameo in both Donkey Konga 2 and Donkey Konga 3. He is among the characters whose artwork appears in Freestyle Zone while the player plays the DK Bongos. In Donkey Konga 2, two Rattlys are engraved on a bridge in the "Port City - Foggy Morning" background scene. Rattly appears as a Spirit in Super Smash Bros. Ultimate. Italian Boatrix From "boa" and the given name "Beatrix"
Rattly (shown as Dixie) bounces on a Buzz. Via hacking, the player can control a partially playable Rattly in Donkey Kong Land III. However, his sprites are missing, and only part of his usual functionality remains intact, most specifically the ability to bounce on enemies that would normally injure the Kongs, such as Buzzes and Bristles. The New Donk City world in Super Mario Odyssey features various references to the Donkey Kong Country franchise. One of its street signs is named after Rattly; however, due to an oversight, his name is misspelled "Rattley". This page was last edited on February 4, 2019, at 02:15.